An artist's illustration of NASA's Kepler space telescope hunting for exoplanets. The Kepler wake-up whipsaw continues. NASA's Kepler space telescope, which has discovered more than 2,650 alien planets to date, emerged from yet another slumber Thursday (Oct. 11), agency officials said. Such relays are only possible during certain windows. The Kepler team relies on NASA's Deep Space Network to catch the incoming data and must share this system of big radio dishes with other agency missions. The $600 million Kepler mission launched in March 2009. Initially, the spacecraft stared at more than 150,000 stars simultaneously, watching for tiny brightness dips that could indicate the passage of orbiting planets across these stars' faces. In May 2013, the second of Kepler's four orientation-maintaining reaction wheels failed, bringing an end to the observatory's original mission. But Kepler's handlers figured out a way to stabilize the spacecraft using the remaining wheels and sunlight pressure, and Kepler soon embarked on an extended mission called K2. During K2, Kepler has been hunting for exoplanets and observing a variety of other objects and phenomena, over the course of shifting 80-day campaigns. 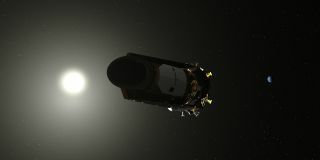 Kepler began gathering data for the latest one, Campaign 19, on Aug. 29. But the mission team put the observatory to sleep less than a month later after noticing that Kepler's pointing ability had degraded. "We are still monitoring the health of the spacecraft while working towards downloading data from Campaign 19," NASA officials wrote in an update today (Oct. 12). Refueling Kepler is not an option. The observatory — which is responsible for about 70 percent of all exoplanet discoveries to date — orbits the sun and is millions of miles from Earth.